That’s right, it’s a new adventure path! Paul is GMing, having just finished GMing a couple-year-long Alternity Star*Drive based campaign. We have six players – Tim, Matt, Patrick, Chris, Bruce, and myself. Matt has been in the other games our large loosely affiliated group runs but hasn’t gamed with us on the Sunday games since a Savage Worlds campaign in 2009. First Session (14 page pdf) – We meet our intrepid crew of adventurers, and are immediately dispatched to the swamp to fight goblins. Oh, joy. We run right into the Licktoad Goblin village and carnage erupts. It was a charge starting out in Sandpoint, because that’s where we started our Rise of the Runelords campaign (most of the same players, also run by Paul) so we had a lot of familiarity with the place. 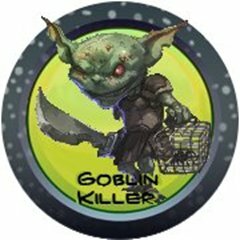 And of course they used one of Paizo’s signature monsters, the wildly popular insane goblins. My idea for my character Hiro’s arc is for him to be a glory-seeking cavalier who over time realizes the true calling of service and becomes a samurai. That was off to a rollicking start as he charged his horse right into the goblin encampment and into a big mud pit that the others had to haul him ingloriously out of. There were plenty of hooks; as Ameiko Kaijitsu’s little brother all the Kaijitsu family historical secrets made motivation a no-brainer. Also, Hiro was trained as a cavalier in Cheliax. I liked how the halfling swamp guy got all offended when Hiro called him “peasant” or “farmer”; Hiro thought he was paying the guy a complement – a farmer’s a much higher status job than “dumbass living in a swamp” in Cheliax at least. 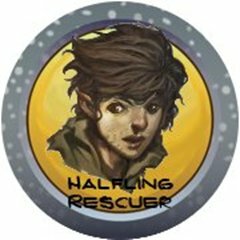 And we got two badges, the Halfling Rescuer badge (optional, though we never can pass up a home invasion) and the Goblin Killer badge (fairly required, I think, or else no pointer to the next part…). Then there was some confusion that we use as an in-joke in many later sessions. There was a shack in the swamp, with a shed outside it. We were trying to investigate both as rat-creatures came from each. Paul kept mixing up the two words to the point where we kept thinking we were near the shack but were near the shed, or the squeaking was coming from the shed but we thought it was coming from the shack (which got me enveloped in a rat swarm, so it wasn’t that entertaining initially). So now whenever a shack or a shed is encountered ever after we say “Wait… Is it a shack, or is it a shed?” Perhaps we should nickname Paul “Two Sheds” as a multi-level homage. We got a lot done, and a lot of role-playing, it was a very long first session and we were going on all cylinders. This entry was posted in session summaries and tagged actual play, adventure path, asian, D&D, goblins, jade regent, Paizo, Pathfinder, RPG, RPGs, sandpoint, session summary, story hour. Bookmark the permalink. I’m running this Path too, and we had the exact same confusion over the shack and the shed. I’m glad someone else did- I don’t feel so dumb now.